Simple Thought #4: Is Church Broken? A good friend of mine asked me yesterday, "Do you think the church is broken?" He wasn't talking about any church in particular, but THE church. Yes, the church is broken...or at least parts of it are. It really doesn't take long to identify lots of broken parts in the church. But, the church has always been broken...or at least parts of it. I have a strange feeling that if we re-designed church the way we think it should be (simple church, authentic community, socially active, Acts 2, new leadership paradigm, etc.) it would still be broken, just broken in different ways. If we got rid of all the big buildings and met in homes, I bet it would be about six months before we started saying "Wow, wouldn't it be nice to have a big room somewhere so we could all get together once in a while?" If we flattened the leadership paradigm, I bet it would be about six months before we started saying "Gee, it sure would be nice if somebody was in charge around here!" Yes, the church is broken...but. Historically, I've been much more of a magazine and periodical reader than a reader of books. I've really only started reading a lot of books in the past five years or so. I read Surfer, Surfing, Rolling Stone, Youth Worker Journal, Group, Leadership Journal and a few others. 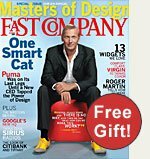 But, without question, my favorite magazine is Fast Company. Interestingly, I can't really put my finger on why! It doesn't have much applicable ministry content, it isn't sports related...but it's just so dang cool. I guess what draws me to it is its focus on creative, initiative taking companies and entrepreneurs. In this month's issue alone, they feature Puma, Sirius radio, Google, and Virgin Atlantic Airlines. We went to this indoor go-kart track a couple months ago and had a blast! Unfortunately, their height requirements make it impossible for most jr. highers, but it sure could be a fun way to spend some time with a group of volunteers. Don't tell him, but we are going to kidnap our executive Pastor on Monday and take him there for a party. Not sure what a guy in his late 60's will think of it, but it'll be fun to find out. They make you wear a helmet, a jumpsuit, gloves and a neck brace. It's mostly just for show, but it does make you feel kinda cool! I'll be at the Youth Specialties 'National Youth Workers Convention' four times this Fall leading a few middle school ministry workshops. One that I'm super excited about, but also beginning to stress over, is a brand new workshop on developing student leaders in middle school ministry. We have a pretty good student leadership program in our ministry, but it's certainly not as good as it could be nor do I feel like an authority on the topic. Without question, our student leadership program is a vital part of our ministry and the students who are involved really like it. One of our struggles with it has always been the question of are we really developing student leaders (and, how do you even measure that...) or is the program just another place for our core kids to hang out together? I suppose it's really a little bit of both. I guess the best way to approach the workshop will be to discuss what an 'ideal' middle school student leadership program may look like and then share a little bit of the 'real'....what it looks like for us and other churches. I suppose I need to take a little pressure off myself. One thing I've learned through the years is that middle school workers appreciate any chance to get together to talk, dream and share our journey. We wrapped up what, overall, has been a pretty decent series. The lesson had WAY too much content (5 points) so I had to speed through it and really couldn't do much to shorten it. Additionally, it was the church-wide ministry fair this weekend so adult services were super short in order to give them time to snoop around the fair. Because of this we had a whole bunch of parents showing up early every service looking for their student. It was a fairly hectic weekend, but a good one. Whoever said 'there's no such thing as a free lunch' was, at least partially, wrong. Today, we decided to meet my in-laws for brunch because we haven't seen them in a few weeks and, frankly, they were missing their grand kids. As we were talking, my mother-in-law mentioned that she's been reading my blog. She commented on the fact that she has never been the topic of a post and I replied that in order for that to happen she needed to do something significant...like buy my lunch. So she did and now I'm posting about it. So while there may be no such thing as a free lunch, there is such thing as a free brunch...if you have a generous mother-in-law. Several people emailed me asking to share some of my learnings from my visit out to Willow last week. Because Scott Rubin and his team were willing to 'pull back the curtain' and give us an insider's peek, I don't want to abuse that relationship by posting too much about them in a public setting. Believe me, everything I would post is good stuff...I don't think I've ever been around a group of youth ministers more in love with Jesus and students than the team at Willow. It's all good stuff...just stuff that Scott can post and share about on his blog (which doesn't exist). However, I will share a few observations. - People in Illinois play a lot of darts. Seriously, every house we went to had a dart board and we always ended up playing. I think it's because they get locked inside for about 6 months a year and really have limited options. They play darts, but they don't play darts any better than the rest of us. I was partnered with Wes, their weekend program director, and we couldn't figure out how to lose. Really, we tried, but we just kept winning. - The gift of hospitality is a huge deal. They let us follow them around for four days. We sat in on meetings, asked tons of questions, asked the same questions again, went to their homes for dinner and darts, went boating....and they NEVER made it seem like an inconvenience. But, of course, it was an inconvenience because in addition to running THREE weekend programs with over 1,000 students they played host to a bunch of out-of-towners all weekend. - That whole Mentos and Diet Coke thing actually works. Well, sort of. One night, the High School team from Willow joined us in some junior high fun. We bought a whole bunch of diet coke and mentos and headed to the park. We tried just about every possible mentos/coke scenario and had a whole lot of laughs and a whole little amount of true success. - It's all about volunteers. Okay, it's really all about students, but you can't minister to students alone. What popped out most to me was the caliber of volunteer leadership in their ministry. They don't just show up and do what they're told; instead they own huge chunks of the ministry and are equipped and empowered to make it happen. It really was awesome to see in action. - Organization is your friend. This is an ongoing learning for me. I don't organize well. It has always seemed to me that organization gets in the way of ministry. The team at Willow is well organized. They think things through. They all know who does what, when and why. The result is a well organized, well lead ministry to young teens. Surprise, surprise! - Jr. Highers are the same wherever you go. They look the same. They interact the same. They have the same attention spans. They have the same insecurities. I think a snapshot of Willow kids would look exactly like a snapshot of kids from your ministry or from mine. Except, of course, for that one dude with a mullet and skin-tight tank top (Really, Scott, the look doesn't work for you)! - Jr. Highers aren't pre-programmed to be squirrely. Well, they probably are. But, they are capable of slowing down, paying attention and contributing to the meeting time. I really was blown away by how well engaged the entire crowd was. Sure, there were a few dipsticks in the crowd, but Scott's team has done something right in the way they build relationships and program in a way that keeps kids wanting to engage. If you've never been given (or taken) the opportunity to visit another junior high ministry in action, I encourage you to do so. Find a church in your community that seems to be doing good junior high ministry and go take a visit. They may not treat you to a rousing game of darts, but they'll probably be happy to show you around. Today will be a great day! I'm sneaking out of the office early to play a round of golf. A local course allows you to play for free on your birthday and while it's not my birthday today, it is Matt Hall's. Matt and I work together on our junior high team and play golf together when we get the chance. So, I'm out of the office a little early, but back into 'The Office' tonight when season 3 kicks off! The Office has become my 2nd favorite t.v. show (just behind 24), which isn't saying a whole lot since I only watch 3 or 4 shows. We are combining a birthday party for Matt with the season premier and having an Office Party at another friend's house. Last night we hosted a 'coaches training dinner' at our house. Coaches are adult volunteers who serve our ministry by keeping in touch with our jr. high small group leaders. They pray for them, encourage them, take them to lunch, hold them accountable, fill in for them when needed, etc. We have 8 women coaches and 1 guy coach. We are having a really hard time getting the men in our ministry to catch the coaching vision, and the one guy we do have shared how tough it was for him last year. The male small group leaders don't seem to respond to the coach the way females do. They hesitate to share struggles, they don't reach out for help and they put on the face of 'I've got it all together'. Question for those who lead youth ministries: How do you minister to your male leaders? Do you have a specific guy strategy? What success have you had motivating them to take the next step in their ministry to students? Simple Thought #3: Pastor or Leader? The topic of leadership is so 'in' right now. This section of local bookstores seems to be growing faster than any other. I should know, because I frequent it way too frequently. I do so because I'm fascinated with leadership. My entire ministry career has been spent in larger 'mega-church' settings that have all put an emphasis on the importance of leadership. Before coming to Saddleback, I served in San Diego on John Maxwell's team (it doesn't get a whole lot more leadershippy than that!). I want to experience joy and fulfillment in my role and calling of being a Pastor. It seems like being a 'Pastor' has lost it's mojo in recent years because the role of being a 'leader' has crept in and stolen it. I'm called to be a Pastor first. If I was called to be a leader first, I'd certainly live that calling out in a higher paying and less stressful environment. I'd look for one of those corporate jobs that has a massive pay-out clause when I get canned. But I'm called to be a Pastor and the local church is where that happens best. Sure I want to be a better leader along the way, but maybe I need to step away from the leadership isle of the bookstore and into the pastoral isle every now and then...if I can stil find it. I wasn't there this weekend because of my trip to Chicago, but was told that the weekend was pretty good. It seems as if lately our weekend adult volunteers are really catching the vision and taking ownership and initiative! Although our message was on the importance of having good friends, we emphasized the need to BE a good friend and to share the love of Christ when he gives us opportunities. All in all...a good weekend. I'm having a GREAT time so far on my visit to Willow Creek. The junior high team has been 100% accomadating. They gave our team a tour, they've spent TONS of time working us through their systems, processes etc. I really feel like we have been given a great 'behind the scenes look' at their middle school ministry. Yesterday afternoon, they borrowed a couple of ski boats and a wave runner and took us out on the Fox River for some wakeboarding. In addition to wakeboarding, they also had one of these and one of these. I tried them both and actually had a suprising amount of success. The wake surfer was the toughest because I could never really find the 'sweet spot' that allowed me to let go of the rope and stay one the wake/wave for more than 10 seconds or so without getting left behind. In a few hours we'll go to the first of all three weekend programs...we'll watch one from behind the scenes and one from the crowd with the students. I'm sure we'll also sneak into the adult service because Hybels is teaching this weekend. 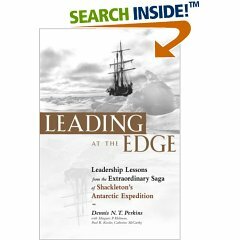 I'm currently reading a great leadership book based based on the saga of Ernest Shackleton. Shackleton was an antarctic explorer in the early 1900's who lead a crew of close to thirty men on an excursion in 1914 that resulted in a survival story like no other. The book focuses on how he lead his men through the ordeal. There's also a really good documentary on the story that I highly recommend. I'm wrapping up class and then flying out to Chicago today, so posting over the next few days will likely be a bit sporadic. I'm looking forward to spending some time with the JH team at Willow. Every time I am around Scott and his team my faith and vision is stretched. I didn't believe it 'till I saw it for myself, but this link (click on the picture of Tanner Dog) will take you to Barbie's new dog....THAT POOPS! Yesterday I started my final Grad School class. Actually, I may need to take one more independent study course depending on what I decide to do for my final project. Anyway, the focus of the class is on natural systems theory which is extremely interesting and equally confusing! After day one (each class is four, nine hour, days), I'm not sure I have a very good grip on the topic. Of course this would not be the case if I would have done more of my reading ahead of time. I leave class a little early on Thursday because the good folks on the Junior High and High School teams at Willow Creek have agreed to let a few of us from our Junior High and High School teams spend the weekend with them. We're going there with the sole purpose to get an up close and personal look at how they do just about everything they do. I'm most excited about spending some time with their Junior High Pastor, Scott Rubin, who, over the past few years, has become a really good friend. I've always said that he's a natural leader learning the junior high ropes and I'm a natural junior high pastor learning the leadership ropes which makes for a good 'iron sharpening iron' relationship. I've asked Scott to help me lead eight hours worth of junior high training at the GROUP/SYM conference in February so we're going to spend some time brainstorming that this weekend. We kicked off a three-week series designed to help students think about what's most important as they head back to school. All of our games were themed around school, we decorated the stage with lockers and school banners and we showed old 'Saved By The Bell' videos as students mingled around. We actually broke our all time attendance record which caught us off guard, and as a result we ran out of our hand-outs and our 'take aways' that we are making available during this series. As usual, a big crowd translates into a TON of energy...some good and some bad! Mike Lovato is a youth pastor out here in So. Cal and served as a full-time intern on my team for two years. On his blog a couple of days ago, he posted this. I found it interesting because I've never really considered myself a junior high guru and certainly not a leadership guru. That he sees leadership as my primary guruness is really interesting to me. But, I have been hanging around junior high ministry for a long time and I have learned some valuable stuff. In honor of Mike's post, I thought I'd share one leadership thought that may be useful. Leading others is never simple. But I've learned over the years that trying to be ethical, effective, efficient, enthusiastic, encouraging and empowering sure does make it Easier. Tulley's has free Wi-fi and is much bigger...the place is packed but it was still easy to find a place to sit. Starbucks is a warmer atmosphere with better drinks. I'll stick to Starbucks but Tulley's seems like a nice change of pace. On my drive over here, three totally random and unrelated thoughts popped into my mind. I'm sad to admit this is the kind of stuff I think about while driving! 1) Why did it take so long for soup companies to come up with the 'pull-off' lid? For years, soup lovers have had to put up with the hassles of can openers, but no more! Also, the whole idea of the microwavable and 'drinkable' soup cans is disgusting....I'm not sure why, but drinking soup instead of spooning it just doesn't work for me. 2) I have to admit to myself that I like the show LOST....but I hate it...but it's pretty good...but it's like some stupid sci-fi, soap opera...but I like it....but I hate it. 3) Will the Broncos at any point in the season decide to bench Jake Plummer in favor of rookie, and QB of the future, Cutler? The saying goes that you should never discuss religion or politics. As a Christ follower, it's impossible to abide by the first suggestion. And since I don't really think war should be a political subject, I'll go ahead and talk about it. War: Generally speaking, I gotta think Christ would oppose war. By nature, it seems to go against his nature. The War On Terror: I believe we were attacked on Sept. 11 by an enemy that wants to devastate our way of life. I think there is a true war on terrorism that needs to be fought...one that we need to win if we value freedom and democracy. The War In Iraq: I'm not so sure Iraq was the most pressing or strategic place for us to engage in the war on terrorism. Saddam is a bad, bad dude and I'm sure he had lots of weapons. I'm not so sure he was the biggest threat at the time or that invading Iraq to set it's citizens free was the best response to 911. War is devastating, so it seems like if we are going to engage in it, we better get it right. It's really hard for me to accept the idea that the people of Iraq are better off today than they were four years ago. Simple thoughts. Unfortunately I think they are simple thoughts on a tough issue that will plague us for a long time. No weekend wrap up because I took an end-of-the-summer vacation...a real one, the kind where you don't even check in to see how things went. 5) Uh....about your mini van we borrowed. 2) Look, if we left your son at camp I'm sure there was a good reason. 1) You don't know what a blue flame is? Here let me show you. Okay, add one or two of your own. In a couple of weeks, we'll host our first annual "Super Sweet Leader Night", a really fun night for our Jr. High and High School volunteer leaders. This marks the first time we've combined forces with the High School ministry for a volunteer event. We're going to make it a real high energy, fun, interactive night that will have very little training, but instead we'll focus on vision casting, setting the stage for the school year etc. As a highlight, we are actually giving away a car to one lucky winner (an old, cheesey car donated by our cars ministry . more of a joke than anything else, but a car nonetheless)! It really should be a super sweet way to kick-off our school year of ministry.